Five local cities and organizations committed to improving air quality through innovative outreach have earned awards for their contributions to Air North Texas, the regional clean air campaign. The awards recognize partners’ efforts throughout the 2018 ozone season, which ends Nov. 30. The City of Dallas again received the Arlo Ambassador Award for advancing the Air North Texas message through the campaign mascot. Arlo the Airmadillo is a native North Texan who loves playing outdoors and visiting local sights while being affected by asthma. Dallas branded its air quality alert emails and social media messages with Arlo and featured him in a Clean Air Action Day promotional video made with the help of children at the Mindbender STEAM Summer Camp. To see the video and social media posts, visit @Dallas_Air on Twitter. For the third year in a row, the City of Grand Prairie is the Air North Texas Partner of the Year. 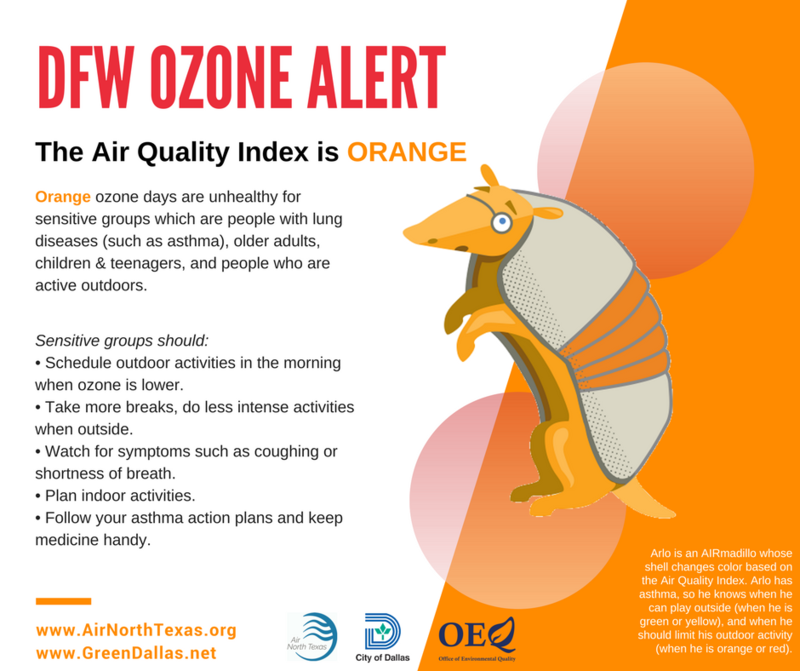 Grand Prairie implemented a yearlong comprehensive outreach and communications plan centered on Clean Air Action Day, a regionwide event held on the first Friday of every summer to call attention to the actions individuals can take to improve air quality. Grand Prairie built community and employee engagement through social media posts, air quality alerts, city newsletters and participation in local events to help raise awareness about air quality throughout the year. These efforts culminated with Grand Prairie’s Clean Air Action Day activities, including an art contest for city staff and the city’s annual corporate Clean Air Challenge. Industry leaders Lockheed Martin, PepsiCo and Siemens participated in the challenge, along with local employers such as Fruit of the Earth and Texas General Hospital. The City of Cedar Hill took home the award for outstanding initiative by featuring Air North Texas in a number of creative campaigns, community events and educational forums. Highlights include EarthX, the region’s largest Earth Day celebration, as well as events in Cedar Hill, such as the city’s Earth Day and Environmental Collection Day programs, the “I Love Clean Air” campaign and Cedar Hill ISD’s Back to School Rally. Hood County Clean Air Coalition (HCCAC) continues to set the standard for clean air advertising in North Texas. For a remarkable fourth year in a row, HCCAC won the award for outstanding advertising with a multiplatform approach. Three public service announcements to promote clean air commitments ran daily on Granbury TV in March, and a PSA encouraging individuals to commit to clean air actions at home aired regularly on local radio stations KTFW 92.1 Hank FM and 95.3 K-HITS. Additionally, the coalition published ads in two local magazines, Granbury Showcase and Weatherford Now. Residents in 12 counties learned about clean air actions through HCCAC’s efforts. The City of Plano received the award for outstanding outreach for using both traditional and digital strategies to engage residents and businesses. Programs and presentations for local businesses and city employees and volunteers emphasized the steps North Texans can take to improve air quality. SEED, Plano’s Sustainability and Environmental Education Division, partnered with other Air North Texas members to install air quality monitors at two local high schools, providing students the opportunity to learn about the science behind air quality. Plano also featured Air North Texas content on its sustainability and environmental homepage, Live Green in Plano, on social media and numerous city publications. 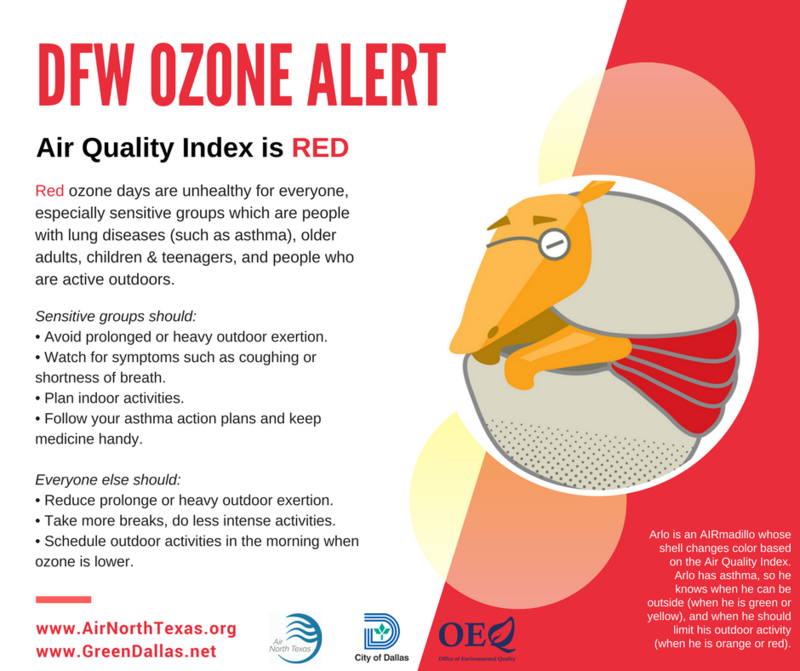 Air North Texas is one of many strategies designed to improve air quality in the nine North Texas counties striving to meet Environmental Protection Agency standards for ozone pollution. Air quality affects health outcomes and helps preserve the region’s quality of life and economic vitality. Air North Texas includes 35 partners committed to educating the public about air quality and motivating them to do something for clean air. Partners encourage residents to take initiative in improving air quality by riding transit, maintaining their vehicles, biking or walking more, carpooling, pursuing energy efficient home improvements and incorporating other clean air choices into daily routines. The North Central Texas Council of Governments (NCTCOG) coordinates Air North Texas. The award committee, composed of previous Air North Texas award recipients and NCTCOG staff, chose the Partner of the Year and outstanding work to recognize based on criteria in the Air North Texas Partner Agreement and information in partners’ annual progress reports. 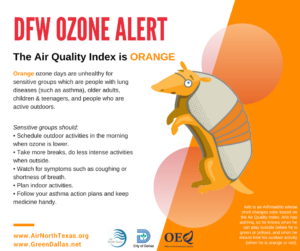 The City of Dallas is one of several organizations involved with Air North Texas, a regional air quality partnership and general public outreach effort. Air North Texas leverages existing resources and program strengths to offer the public a comprehensive resource for air quality information. Collaborative efforts focus on reducing harmful emissions, protecting public health and welfare, motivating residents to make choices that improve air quality and preserving the economic vitality of the region. Visit www.airnorthtexas.org to learn more.